A honeymoon in Napa Valley is the dream of many marrying couples, especially for the bride. Napa Valley is the ultimate destination for who are going to get hitched or as the place to have their honeymoon. Many people also choose Napa to be the venue for other events before the big day, like the bachelorette party. A bachelorette party is basically a “ladies’ night out” (or a “day out” depending on the preference) put together mostly by the bridesmaids and the maids-of-honor. When planning to have a bachelorette party in Napa, make sure to book early especially if you plan to do it in the summer. Booking early is smart because summer is the peak season in the Wine Country with so many events and goings-on, there will be a lot of people visiting Napa. There are so many fun things to do when planning a bachelorette party in Napa. If the bride-to-be is a foodie, then a food tour is the perfect idea. Napa is the home of many Michelin-starred restaurants but there are also other more affordable street side cafes and “hole in the wall” restaurants. Of course, there is also Napa’s world-famous wine to go along with the excellent dinners prepared by world-class chefs. You can schedule your own food tour, or let someone else like Gourmet Walks arrange it. Having a “spa day” can be another great idea when hosting a bachelorette event. In fact, spa bachelorette parties are an “in” thing these days! Napa Valley, of course, isn’t short of luxurious spas, and the bride and her girlfriends will choose a variety of spas and massages, facials, full-body scrubs, saunas, mud baths, and so much more. Since you’re in the wine country, a wine tour should not be forgotten! The best plan is to have a guided private wine tour and have a wine expert pick the best wineries for your visit. And who wants to sit behind the wheel when you and your girlfriends are thinking of nothing but having a good time? Have a chauffeured wine tour and stop at some of the wineries, visit their tasting rooms, and maybe have a good picnic at the patio which offers a splendid view of the vineyards. You may even choose to take a bottle home! 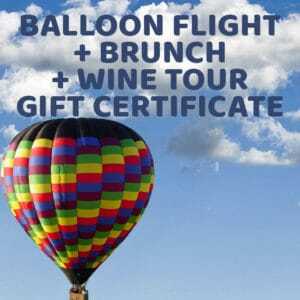 Why don’t you take the bachelorette party and wine tours up… up and away? Make it extra memorable and special by taking the party to a hot air balloon and have the party ride of your life! As the balloon takes flight, you and your girl friends will enjoy uninterrupted views of the Napa Valley during sunrise — neat rows of lush vineyards set against the rolling hills and deep valleys, seeing the sun rising fully in the sky, and a moment of tranquility. Of course, you will not forget to take souvenir pictures and selfies! If you want to book a hot air balloon flight for your bachelorette party, you can count on Balloons Above the Valley (BATV). From scheduling it down to the flight itself, we guarantee you the best service and the pleasure that you deserve! We offer packages that have a combination of the conventional wine tours in Napa and Sonoma, in addition to the sunrise hot air balloon ride. Pre-flight breakfasts, post-flight champagne brunch celebrations, and optional sightseeing and shopping are included in some of our packages. If your scheduled flight is cancelled due to bad weather — hot air balloons rely on a good weather for a successful airborne journey — we will reschedule the flight for you! If you want your hot air balloon bachelorette party to be more like a private get-together (and it should be!) BATV also offers the Exclusive Flights packages which also include a private table at the champagne brunch celebration after the flight. The bride-to-be and her friends always look for something special to celebrate her “last hoorah” of singlehood before she ties the knot. Having a wine tour, a food tour, a relaxing day at the spa, and a thrilling hot air balloon ride over the picturesque Napa Valley will perfectly start and end any bachelorette party, just before the wedding and honeymoon in Napa Valley.